The pawpaw, a native tree fruit, grows wild throughout most of the eastern U.S., from Kansas to the east coast and from Florida to Michigan. 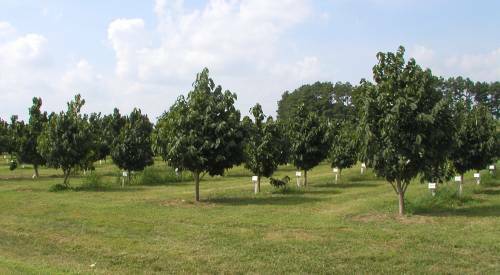 A collection of different pawpaw cultivars, selected for large fruit size, yield and superior taste, is currently being renovated at the Horticulture and Agroforestry Research Center (HARC). Annonaceae is a botanical family, often referred to as the custard apple family, made up primarily of flowering plants located in tropical regions. The pawpaw is part of that family. HARC is currently home to a pawpaw cultivar study, which originally contained 10 different named … Expand ▸HARC is currently home to a pawpaw cultivar study, which originally contained 10 different named cultivars. The Center also works with Kentucky State University, home to the national germplasm repository for pawpaws, and has added two newly released cultivars – ‘Atwood’ and ‘Benson’ – to the collection at HARC. The pawpaw, a native tree fruit, grows wild throughout most of the eastern U.S., from Kansas to the east coast and from Florida to Michigan. Pawpaw is not typically grown by farmers. 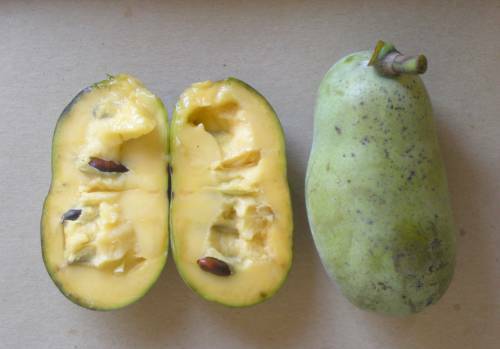 A collection of different pawpaw cultivars, selected for large fruit size, yield and superior taste, is currently being renovated at the Horticulture and Agroforestry Research Center (HARC). Ken Hunt, a retired research scientist with the Center for Agroforestry, planted the first pawpaws at HARC in 1999. HARC is currently home to a pawpaw cultivar study, which originally contained 10 different named cultivars. The Center also works with Kentucky State University, home to the national germplasm repository for pawpaws, and has added two newly released cultivars – ‘Atwood’ and ‘Benson’ – to the collection at HARC. Sunlight is key for pawpaws to reach their potential. Gold said in the open, the trees can grow up to 25 feet in height. In Missouri, pawpaw cultivars ripen from August through early October. Pawpaws can be used like bananas in smoothies, bread, muffins, yogurt and ice cream. Gold said he … Expand ▸Pawpaws can be used like bananas in smoothies, bread, muffins, yogurt and ice cream. Gold said he enjoys eating pawpaws directly from the freshly harvested fruit, scooped out like a custard. Pawpaws are fully ripe, or in “primetime,” for only four or five days. Gold said it doesn’t do any good to pick the fruit early and let it ripen. Once the fresh, ripe fruit gets beyond the four- or five-day period, the pawpaw fruit becomes overripe and aren’t nearly as desirable. Gold said there are a number of ways to enjoy pawpaws. Pawpaws can be used like bananas in smoothies, bread, muffins, yogurt and ice cream. Gold said he enjoys eating pawpaws directly from the freshly harvested fruit, scooped out like a custard. The biggest commercial hurdle for the fresh fruit is a very short period of peak ripeness. There is a market for the pawpaw pulp, and if the pulp is frozen, it gives the fruit a longer life. The pawpaws grown at HARC have been turned into ice cream, through MU’s Buck’s Ice Cream, and used during several events including the annual Missouri Chestnut Roast. Regardless of flavor, everyone can agree the pawpaw fruit is very rich. “I like to call it the cheesecake of fruit,” Gold said. HARC’s pawpaws are grown without pesticides, as pests usually aren’t an issue. The biggest commercial hurdle for the fresh fruit is a very short period of peak ripeness. There is … Expand ▸The biggest commercial hurdle for the fresh fruit is a very short period of peak ripeness. There is a market for the pawpaw pulp, and if the pulp is frozen, it gives the fruit a longer life. The pawpaws grown at HARC have been turned into ice cream, through MU’s Buck’s Ice Cream, and used during several events including the annual Missouri Chestnut Roast. “Not too many pests bother them,” Gold said. “In the fall, there is a chance that the critters will get to them before you do. We have actually never sprayed the pawpaws. We’ve had some leaf roller insect damage but that’s been the extent of it. So far, our pawpaws have come through unscathed. There are many different pawpaw cultivars and each one is unique. HARC is currently working to bring awareness and find marketing opportunities for pawpaws. 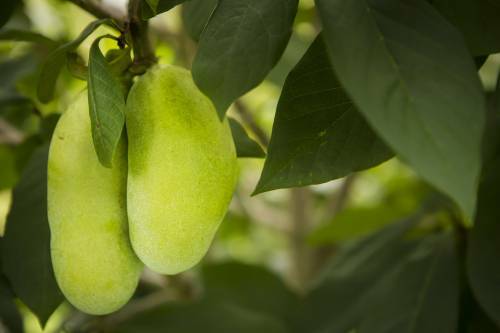 The first step is to do market research – and find out how much the general public knows about pawpaws. The Center recently completed a national consumer survey about pawpaw. The survey was distributed to individuals who are members of the North American Pawpaw Growers Association; attendees of the 2016 International Pawpaw Conference in Frankfurt, Kentucky; and participants at the 2017 Ohio Pawpaw Festival in Albany, Ohio. Long used by Native Americans, the pawpaw also has a long history in the United States and was mentioned in the journals of Meriwether Lewis and William Clark as they made their trip up the Missouri River following the Louisiana Purchase.